Wait, what!?! I don’t have to “exercise” to be healthy? Yes, you read that right. You can be happy, healthy, have great blood sugar management, and maintain a healthy weight without “exercising”. And I bet you are already doing a lot of the right things; you just don’t know it yet. So what kind of voodoo am I talking about here? Believe me, this is not a post about how we don’t have to ever be active. It is a post where I would like to challenge your perception of what exercise is. Most of us move daily. We climb stairs, we shop, we clean, we play with our kids, we walk around the neighborhood; the list goes on. And all of that movement counts towards our daily activity goal. The general weekly exercise recommendation for adults is 150 minutes per week. That is roughly 20 minutes per day. Well, imagine this: If you walk your kids home from school instead of taking the car, you climb the stairs every time instead of taking the elevator or you go for a walk every night after dinner, you will reach that goal easily. One of the ways that I get in my weekly activity, in a way that I enjoy, is by walking my dog. 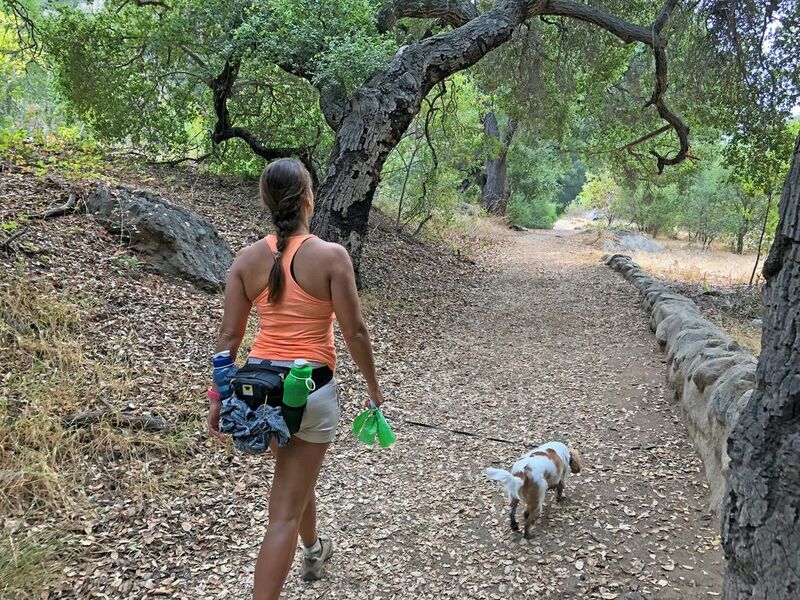 Not only does it count towards my daily activity goal, but I also get out into nature, my dog gets to go for a walk, and walking does wonders for my blood sugar. Every type of movement is good! It doesn’t have to be walking, it can be dancing, swimming, rope jumping, biking, basketball, tennis, whatever you enjoy. Don’t worry about what everyone else is doing; find what makes you happy and what makes you want to move. If 20 minutes of movement seems daunting right now, break it up into smaller chunks. Even during days where I’m silly busy, I can always find 5 to 10 minutes here and there to move a little. Even just walking around the house for 2 minutes twice per day while brushing my teeth helps a little! When you find a type of activity you enjoy, it becomes much easier to make daily movement a part of your routine. I so truly enjoy my walks in nature with my pup Zoe that I will schedule a day of the week where we go explore a new place. I look forward to it and don’t think of it as exercise at all. I just simply think of it as something I enjoy. I know it can be hard to get started. I used to think that there was no way I could set aside a whole morning every week to go walking. But I managed to change that thinking by identifying my “why” for walking, setting weekly goals for myself, and arranging my schedule to make it work. Your “why” or your motivation should be rooted in the positive things your favorite activity does for you. My top 3 “whys” are how much I enjoy getting out into nature, how happy my dog is when we walk, and how well my blood sugars react to walking. I try to stay clear of the negative reasons, (like “I’m lazy if I don’t get my movement in”) simply because that kind of negative motivation isn’t mentally healthy. It is great to have your “why” defined, but regardless of how much you enjoy whatever activity you have chosen, setting goals and having a plan for achieving them helps a lot. Every Sunday, I will look through my calendar for the coming week and schedule my weekly walk. And when adding in my other weekly activities, that plan easily gets me to the 150 minutes of “exercise” per week goal. But what if you are not used to moving that much? All beginnings are hard, especially mentally. Those small fears of failure, what others might think, how our blood sugar will react, etc. can start creeping in and can become mentally paralyzing. What I do in such a situation is to first recognize my fears and mental barriers for what they are. Sometimes just saying out loud what you are afraid of can defuse it a little bit. Secondly, I tell myself that the goal is not perfection - the goal is doing my best! Some people don’t feel comfortable being active around other people. If you feel like that, simply start out by yourself and slowly build up confidence. If you like to walk like me, do it early in the morning or when the neighborhood is quiet. Finally, when it comes to the fear of wonky blood sugars as a result of movement, I believe that fear is real. Most of us living with diabetes have experienced dropping or increasing blood sugar as a result of activity and know how scary, confusing, and frustrating that can be. You are not alone! And you can do this! One of the things that has helped me the most in being active is finding great communities. I have played basketball, taken dance classes, and done group fitness classes. All of them had the common denominator that I was active with others. I show up because I enjoy the activity, but also because I enjoyed the peer support and camaraderie. In fact, several of my best friends are people I met through group sports and classes. You can find groups pretty much all over the world that enjoy the same activity as you do, and even if you live remotely, there are online peer groups that can help you enjoy being active and give you advice. You don’t have to start alone! As we continue our journeys of being active, healthy, and happy without “exercising”, we will grow and may become more adventurous. I often update my goals and plans as my priorities change. I will continue walking my dog, but during winter, I might prioritize yoga or something else over longer walks for a while. And that is okay. I will pat myself on the shoulder and celebrate every walk as long as that is my goal. When that goal changes, or my “why” does, I will make a new plan and enjoy that one as long as it is relevant. So, remember, it is really not that important what you do to stay active, as long as you do something! Your diabetes is not the same as my diabetes – and we don’t have to follow the same diet.